Practical & creative advice on how to demonstrate a positive return on your digital signage investment. Ask a project or marketing manager how they plan to measure a return on investment (ROI) on a digital signage rollout within the enterprise, and you’ll hear such things as branding, messaging, or the most nebulous of measurements, “awareness.” Then ask any CFO, and the equation becomes very black and red: How much is it going to cost, exactly how much money will this add to the bottom-line, and how quickly? R over I equals: you better have a better answer. 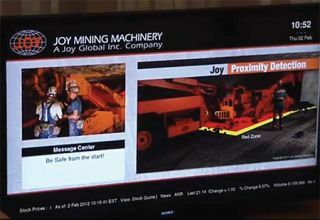 Joy Mining Machinery, a worldwide manufacturing company headquartered near Pittsburgh, PA, uses digital signage to post safety information reminders as well as statistics on safety. They have found that there has been a huge return on investment from the standpoint of less accidents happening within the facility. Unlike the retail or fast food industries where there can be a direct correlation from the customer to a sale, digital signage in an enterprise environment takes a deeper level of planning to get to the bottom line. “One of the keys things that I always tell people is, that you have to set clear goals and objectives for your signage project before you start,” said Gina Dickson, director, global product management, technology product solutions at Black Box Network Services. “When you are in the enterprise, in some cases it is the Return On Objectives, not necessarily Return On Investment.” Having a full understanding of what you want to achieve is critical, and this should be done well before considering what system to purchase. With getting a CFO involved early, “A lot of it is going to come down to the application,” Dickson shared, citing BlackBox customer Joy Mining Machinery, a worldwide manufacturing company headquartered near Pittsburgh, PA. Branding and messaging were the initial objectives at Joy Mining, however as more departments realized its reach, the signage system was expanded to other areas of the company to improve manufacturing quality and efficiency. The company’s engineering staff wanted the ability to provide engineering metrics to staff, and HR wanted an easier, faster way to announce job bids and awards in its many facilities. Protecting your initial investment is one of the strongest cases for choosing a scalable system. “Maybe on day one, you only need your signage system to inform people,” Dickson said. “What we tend to see with signage is, once a customer starts down that path they start to get more ideas of what they can do with their signage within their enterprise.” Adding touchscreens, or interactive devices that provide feedback are some of the common evolutions of an initial investment. Beyond the initial investment, it is important to think of the total cost of ownership. “What’s nice about a good, scalable platform is that you can start with one objective and turn that into others in different areas of the business,” Dickson confirmed. BlackBox has customers that have used their platform to work with sales gamification programs to create competition among their sales teams. While gamification might not be the appropriate tool outside of sales, most departments within an organization has goals and milestones that can be positively communicated to help increase productivity and boost teamwork.